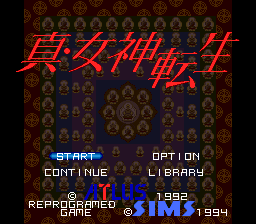 Shin Megami Tensei (真・女神転生) is a 1992 game for the Super Famicom by Atlus ported to the Sega Mega-CD by SIMS. The Mega-CD version was only released in Japan. Main article: Shin Megami Tensei/Magazine articles. NEC Retro has more information related to Shin Megami Tensei.